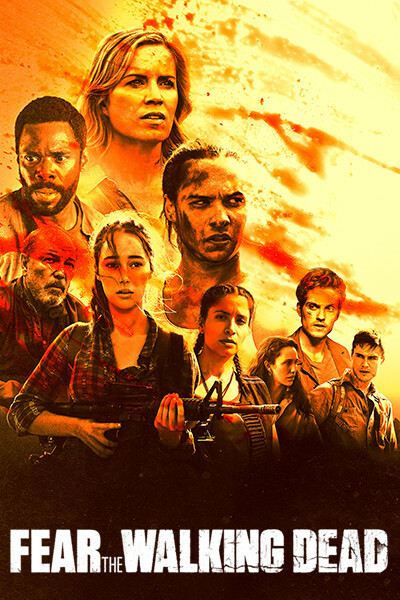 When last we left Fear the Walking Dead, Madison had just purchased Strand's debt. The plan is is to head to the damn that Strand knows of in the hopes of setting up a long term deal to trade for water which the ranch so desperately needs. This means it's road trip time. On the road to Tijuana, they come across their first stoppage when a huge herd heads in their direction. If that were not enough, the road is also blocked by overturned cars. Walker is instantly irritated but Strand throws a beeper out of the window and the zombies are supposedly distracted enough by that to change their path. We have to pause. Look, to watch this show, you kind of have to suspend reality but having Strand throw that beeper and have it actually work is beyond ridiculous. A teeny tiny beeper is somehow louder and more forceful than the engine of a truck? With the zombies out of the way, Walker slowly pushes the cars aside enough for his truck to get through. Their next stop is at a car lot. Victor has to rush to close the gates to stop the zombies from following them in. This is the second unbelievable moment of the episode. The zombies are pressing all of their weight on a chain link fence held closed by a flimsy chain and yet somehow, it all holds together with no sign of collapse. Do better writers, it's been barely 15 minutes and you've slipped very far very quickly. Walker is impatient with Victor, as he searches for a car. Walker's impatience turns to outright suspicion once the car is found and an entrance to the sewer is revealed. Walker does not like the idea of traveling through the sewers following Victor's lead in the least. Victor assures Walker and Madison that this is the fastest way forward, leaving Walker no choice but to agree when Madison makes it clear that she is following Strand's lead. In the tunnels, Walker's impatience appears again and this time it's because he's certain that Strand is actually lost and is leading them in circles. Strand maintains his facade in front of Walker but confides in Madison that Walker is right. It turns out that he's been looking for the symbol of an eye which will indicate which tunnels lead to the damn. Madison is not willing to go up and convinces Strand to keep looking. Victor also confesses that Daniel is at the damn but this is not a concern for Madison because of course, Ofelia is at the ranch. Strand finally locates the correct tunnel and Walker says that they have to hurry because they are being pursued by zombies. They move quickly down the tunnel only to find the ending blocked by a zombie who has become inexplicably stuck in the opening. For some reason, the zombies who are in pursuit stop following when the trio reaches the end of the tunnel. Madison, being a pragmatist, hacks away at the zombie until she manages to cut it loose from the tunnel entrance. Daniel is riding away with the water truck and being pursued by a group of thirsty people. When they shoot, Daniel returns fire, killing one person in the process. Daniel's response is frowned upon Efrain, who clearly is still in rainbow and unicorn land about how dangerous of a situation they are actually in. Daniel and Efrain argue, with Efrain promising to see Lola about Daniel's actions. Yes, that makes Efrain a damn snitch. Daniel starts to close the gates when he spies movement in the bushes and so heads in that direction. Daniel fires off a shot and manages to miss Strand, who he is not pleased to see. It's only when Daniel spots Madison and she orders Walker to lower his weapon that Daniel finally relaxes. Madison is quick to explain that Ofelia is safe on the ranch and that Walker saved Ofelia's life. Madison doesn't waste anytime letting Daniel know that the ranch is desperately in need of water. I think this episode would have been better titled, "A Game of Chickens and Three Captains", because it essentially encapsulates the episode far more than Tempest does. When we last left the Nathan James, they had taken on some refuges, unaware that a member of her majesty's navy was aboard for the ride. Fletcher was given the choice of country or the friendships he had made aboard the Nathan James. And Mike, was dealing with feelings for loss once again. There are actually three captains onboard the Nathan James right now but since the men are giving each other latitude, this means that it's working for now. Poor Meylan is supposedly in an XO position, Mike continues to be the captain and Chandler, while maintaining the rank of captain, is functioning more like an adviser. Yes, this means that Tom still gets to give orders to those of lower rank but he doesn't speak over Slattery or contradict his orders. This works out well when both Mike and Tom decide that the best way to ditch the Greek naval ships which are surrounding the James and threatening to herd it into position is to steer the ship into a storm. Cue triumphant American patriotic music. Okay, The Nathan James is sailing into a massive storm and now Fletcher has to decide where his loyalties lie. Sinclair fakes a heart attack and is taken to medical which is conveniently where the seeds are being stored. The resident doc checks out Sinclair and decides that he's had a panic attack because he can see no cardiac symptoms. Sinclair waits until the doctor's back is turned before killing him and taking off with the seeds. Having placed a call earlier to allow the Greek ships to be able to track the Nathan James, Fletcher is running against to the clock to do his part in ensuring that the seeds make it safely off of the ship. Unfortunately for Fletcher, his cover is burned when a crewperson in communications recognises the number he called. It's a short leap from there for the crew to realise that Fletcher is the snitch/traitor. Tom pulls the alarm and the crew gets armed, determined to stop Fletcher and Sinclair's escape. The situation becomes urgent when Tom finds several bodies in sick bay and of course, no seeds. Unfortunately for O'Connor, who is outside doing some work to stop the engine from going kaput, he doesn't hear the alarm which alerted everyone else to take action and pay attention. When O'Connor comes across Sinclair, he thinks that Sinclair is a refugee who got panicked by the storm and fled. Sinclair attacks and ends up stabbing O'Connor in the neck. Tom heads outside and when he spies Sinclair, Tom shoots him. An injured O'Connor falls to the ground, as Sinclair takes off. Tom rushes to O'Connor's side but isn't able to save him. Sinclair, having put some distance between himself and Tom, isn't in any kind of shape to leap off the Nathan James, into a massive storm. Fortunately for Sinclair, this is when Fletcher arrives. Sinclair hands the seeds to Fletcher, telling Fletcher that the future of the world is now in his hands. Fletcher hesitates but he takes the seeds and heads towards the stern. This of course is when Sasha makes her way outside. Fletcher and Sasha make eye contact before he disappears. The next day, helicopters do a grid search to see if they can find any sign of Fletcher but they come up empty. Coming up empty in the search, the leadership of the crew get together to discuss events. They spend a few moments discussing the five crew members which were lost in Fletcher's escape. Tom is absolutely certain that Fletcher is still alive, though he has no proof of this assertion. You just know he is going to go all Ahab over this one. With everything on the line, it's time for the ship to go balls to the wall and hunt down Fletcher. Slattery declares the meeting over and everyone heads out with the exception of Sasha and Tom. Sasha declares that Fletcher could not have fooled them all of this time and that he was with them until the Nathan James picked up the group of food refugees. Sasha's feelings are clearly hurt because she cared about Fletcher but she is also wary about her ability to correctly judge someone and their intentions. The acclaimed British series delves into the deepest and often darkest aspects of our dependency upon technology. Each individual story (there is no concurrent storyline) presents a fascinating analysis of where we could maybe be heading. Writer Charlie Brooker leaves little to the imagination with certain topics, with key episodes involving the infamous 'The National Anthem' and 'The Waldo Moment'. Time for a little sci-fi after the first two rather sinister options! Who better to place your faith in that Captain Luc Picard - played by Patrick Stewart in an iconic role - as he leads the Starship Enterprise crew through the universe. Sure it may be twenty plus years old but it stands the test of time. Perfect for a Sunday afternoon little dose of escapism and dare we say it - nostalgia. Quite possibly the show hosted on Netflix that most divides opinions, the long running zombie saga is nevertheless incredibly popular. Is Rick Grimes a hero or villain? Truth is the show is not really about the zombies all that often, it is more about how humans band together in times of crisis, remorseless in showing the good - and bad - aspects of how it could play out where society to suddenly collapse.